Subdued consumer spending was one of the main reasons for the Netherland´s poor economic performance in 2012 and 2013, when measures to trim the budget deficit, a persistent slump in the Dutch property market (that has left many home owners in negative equity) and higher unemployment heavily weighed on consumer confidence. After two years of contraction, the Dutch economy rebounded again in 2014, by 0.8%, and is forecast to grow 1.7% in 2015. However, this recovery is expected to remain fragile for the time being. In 2014, Dutch consumers´ purchasing power grew again for the first time in four years, by 1.5%, and another 0.5% increase is expected in 2015. Although private consumption continued to shrink slightly in 2014 (down 0.1%), it is forecast to increase 0.9% in 2015, fuelled by higher disposable incomes. While stronger consumption growth is still held back by lower house prices, this effect is at least bottoming out. However, the debt ratio of Dutch households of around 130% of GDP is still higher than that of its EU neighbours. 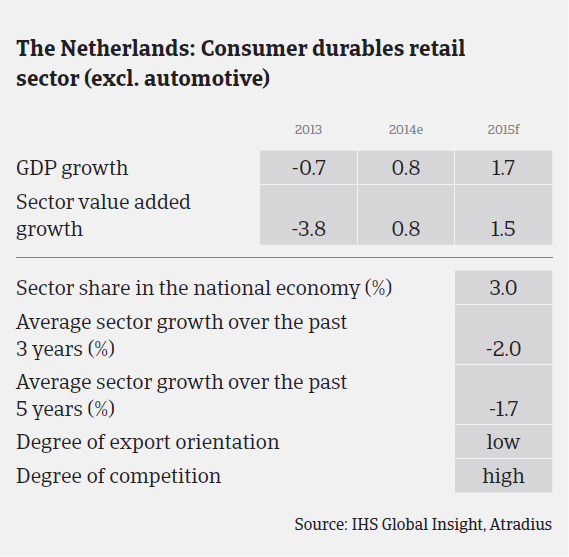 Despite the still fragile situation, in 2014 Dutch retail trade has benefited from higher consumer confidence, economic growth and purchasing power. According to Statistics Netherlands (CBS), retail sales volumes increased 1.0%, the first year-on-year growth since 2008. Mainly non-food shops registered turnover and sales volumes increases. However, sales prices continued to decrease due to the strong competitive business environment. Sales volumes increased in the consumer electronics (up 7%) and do-it-yourself (DIY, up 2.6%) segments; however, sales volumes of household items shrank 0.8%. Furniture and household appliances still suffer because consumers are bound by tough financing rules and have less to spend on those items. In 2015, non-food retail sales volume growth is forecast to accelerate to 1.3%, given increasing consumer confidence and rising household consumption. While demand is improving, it is also expected that competition and subsequent pressure on prices will remain high, and the deterioration of profit margins of many businesses in this industry will continue. At the same time, access to bank loans remains limited for many companies. 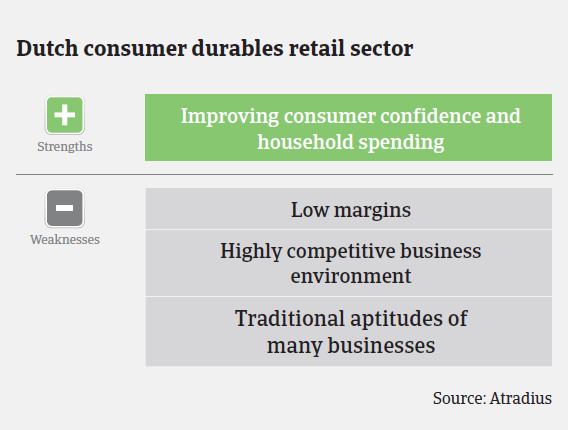 On average, payments in the Dutch consumer durables retail sector take around 60 to 90 days. While notifications of late payments still increased in 2014, we expect them to level off in the coming months, given better growth prospects for the industry. Retail insolvencies decreased 30% year-on-year in 2014, to 644 cases. However, in January 2015 insolvencies increased again, and in contrast to the general Dutch business insolvency development, we expect no further significant decrease in the coming months. 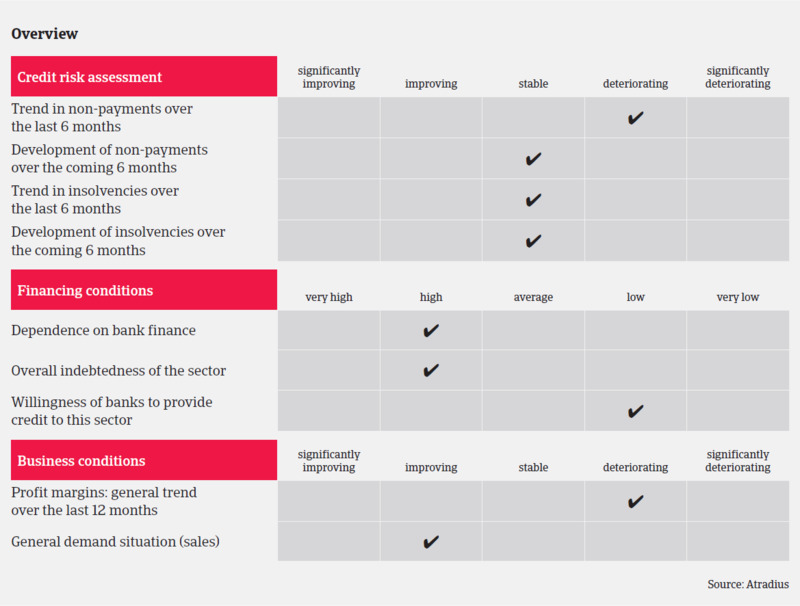 Our underwriting stance remains cautious, given the on-going difficulties in this sector. Close attention is paid to businesses´ turnover and margin development as well as their ability to sell online. Given persistent overcapacities, especially in the brickand- mortar businesses segment, non-food retailers’ resilience and ability to survive increasingly depends on successfully combining offline (shopping floor) and online sales channels. This accounts for all retail subsectors such as clothing, shoes, textiles, furniture, household appliances, DIY, consumer electronics and personal care. According to CBS, following increases of 9% in 2012 and 10% in 2013, both considered to be difficult years for the sector, mail order and web-shop retailers´ turnover increased nearly 10% in 2014. It cannot be excluded that businesses unwilling or unable to adapt to the changes in shopping behaviour will sooner or later cease to exist. This trend could mainly affect smaller businesses, which often lack the required financial strength to make the necessary investments.